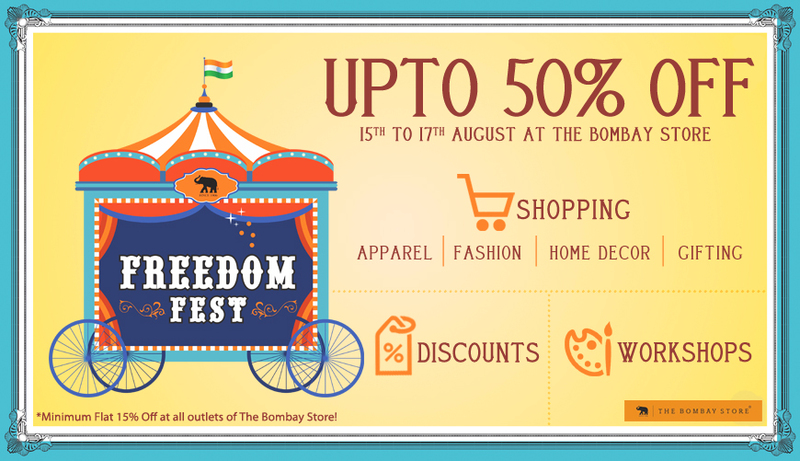 The Bombay Store is showing off its patriotic colours with a big, fat three-day Freedom Fest. Much in the spirit of swadeshi, we present to you a three-day art extravaganza with plenty of patriotic fanfare and fun to commemorate this Independence Day. Throughout the weekend you can engage yourselves in wide gamut of artistic activities ranging from Pottery workshop, Nail art, Tea tasting by Chado Tea, Jewellery making, Idol painting, Wood carving, Shoe painting, Marble inlay and Decoupage art. The occasion will also feature display of art, crafts, paintings, home décor and accessories by acclaimed artists/ craft makers inspired by iconic images of contemporary India. ‘Freedom Fest’ will showcase the best of design from both established and emerging talent, providing a perfect platform for visitors to choose Indian crafts in vibrant color palette, rich textures, forms and themes. The display will encompass Bed & Table Linen by ‘Design Pataki’, Photo Plagues by ‘Engrave’, Dhokra art by ‘Kara’, Home Décor & Accessories by ‘Maati’, Hand made crafts by ‘Matsya’, Fashionable Bags by ‘Nomad’, Fashion Accessories by ‘All Things Sofeez’, Personalized temples in panch dhatu metal by ‘Soul Works’, Indian Ethnic wear by ‘Tree of Life’ and ‘Wumaniya’, Personal Care by Shuddhi Therapy and Luxury Home Décor by ‘Tvaksathi’. We will also be offering flat 15% off on all our product range and upto 50% discount on selective products during the three-day fest at all our outlets. All workshops will be free and on first come first serve basis, subject to prior registrations. Address: The Bombay Store, PM Road, Fort, Mumbai – 400001.